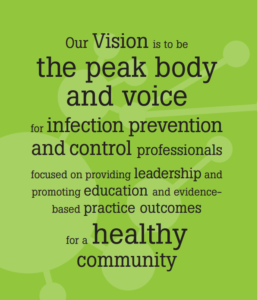 The College is the peak body for Infection Prevention and Control professionals in the Australasian region. We commenced in January 2012 bringing together the various State and Territory infection control associations formerly in AICA (The Australian Infection Control Association) to support and encourage collaboration across Australasia using a corporate model. AICA was formed in 1985 bringing together the various State and Territory infection control associations to support and encourage collaboration at a national level. It became clear though that the structure of AICA had limitations and it was resolved to work towards a new model that would ensure a sustainable organization, with a clear delineation between management and professional activities that could be adequately resourced. To realise this vision a National Consultative Steering Group was formed, made up of key stakeholders from the College membership. Consultation with members resolved that the new organisation be a College, reflecting an emphasis on education and be Australasian rather than Australian, recognising the location and relationships within the region. The vision for the new College was given form with the work of the Steering Committee and came to fruition at the AICA Annual General Meeting held on Wednesday, 9th November at the APSIC (Asia Pacific Society of Infection Control) Conference in Melbourne when the members voted unanimously for the formation of the new entity. The College is a company, limited by guarantee and incorporated under the Corporations Act and the head office is in Hobart.